If you enjoy this post, please consider pinning it or sharing it to your Facebook. Check out more low carb recipes by clicking here. I’m currently working on getting back on the low carb bandwagon, because it is always so good to me when I do! I will freely admit to getting derailed during the holidays though. Not because of temptation, but mostly because of travel and being so busy. Fortunately, my husband is very enthusiastic about low carb eating so that is a great help. Dishes like this also help when the salty, crunchy cravings hit. These zucchini fries are one of my current favorites. I have been making them several times a week for Ricky and myself and we just love the crunchiness and burst of flavor from them! They have the taste of a fried treat but are far less work and mess, so that is yet another point in their favor. 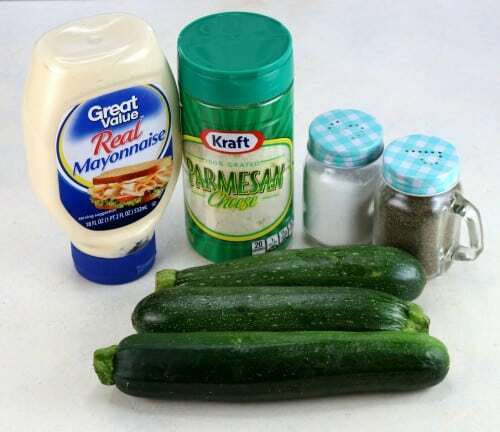 To start with, you’ll need: Mayo, Parmesan Cheese, Salt, Pepper, and Zucchini. I usually use one zucchini for each of us. Why I am Using Powdered Parmesan: I know a lot of folks will be tempted to buy the shredded parmesan but I have made them with both and the powdered is really and truly the way to go. It creates a wonderful coating that sticks really well whereas the shredded parm tends to melt and slide off the zucchini. Set up a breading station by mixing your parmesan cheese with your salt and pepper until good and mixed. 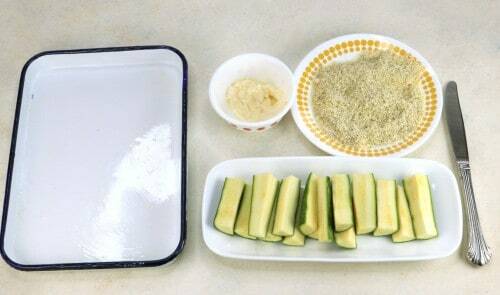 Cut your zucchini into half, then each half into fourths to make wedges. I also cut the ends off but that’s up to you. If you like (totally optional) you can take a paper towel and wrap it around each one and give a little squeeze to a make them a little more tacky so the breading sticks better. Sometimes I do this, sometimes I don’t, they all turn out great regardless. Some people try to make these high maintenance but they’re really not. Using a knife, spread each cut side of a zucchini log with mayo. You’ll be amazed at how easy it goes on and sticks. Then, press each cut side into your parmesan mixture. Place them all on a lightly greased baking sheet. Bake at 450 for about thirty minutes, or until they are brown and crunchy on top. The first time you do this, check on them around 20 minutes just to make sure they aren’t overcooking in your oven. Serve immediately either on their own or with your favorite dipping sauce! 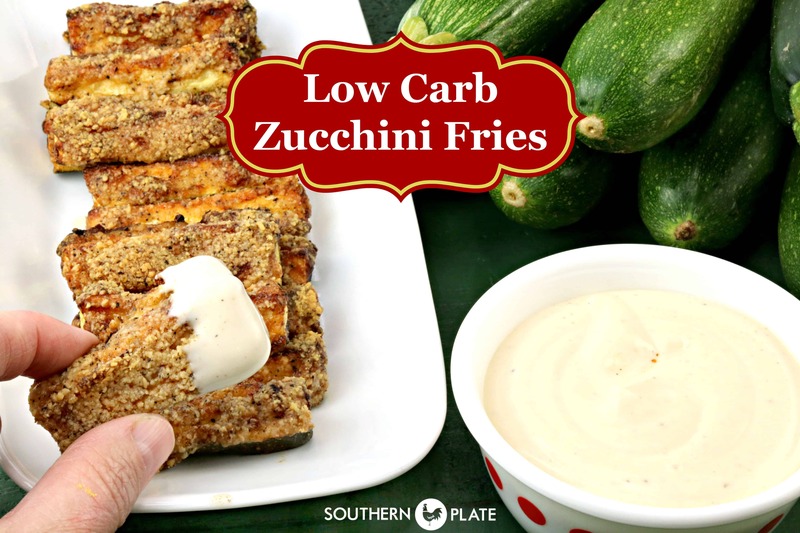 Low Carb Zucchini Fries - YUM! In small bowl stir together parmesan, salt, and pepper. Set aside. Cut each zucchini in half across the diameter and then cut each half into four logs or sticks. Optional: Use a paper towel to gently squeeze each wedge before moving on to the breading. Using a knife, spread a thin layer of mayo on each cut side of each wedge and then dip the cut sides into parmesan mixture. Place on lightly greased baking sheet and bake at 450 for 20-30 minutes. *Please salt and pepper to your taste. I enjoy mine very peppery with a good zing of salt. You know your taste buds best so use your own personal judgement when it comes to adding salt and pepper. See more low carb recipes by clicking here. You know what? I would just love it if y’all would “like” my Facebook page. I mean, seriously, it would mean the world to me because I’m trying to build it up a bit right now. Click here to visit me there and click the “Like” button up at the top. While you are there, scroll down just a bit and check out my Question Of The Week Video. Leave your answers in the comments beneath the video if you are so inclined and seriously, thank you! I mean it. I really do appreciate you! Oh Quinn, thank you so much! Thank you thank you thank you! Christy you said you didn’t like Mayo, neither does my husband, can you taste the mayo? Christy, you may be able to add a little of mustard to the mayonnaise. I would substitute mayonnaise for mustard but afraid it would change the taste completely. Me and my oldest son don’t care for ketchup so we eat our fry’s with mustard. I’m not a ketchup eater either. I recently discovered discovered fry sauce. It is amazing and can be changed up anyway you like. I have been reading all your low carb articles and have enjoyed them so much..am trying some of your recipes..love the egg breakfast cups..please share all the low carb recipes you have..love your site..am going over to Facebook when I finish this..thanks!!! Oh Faye thank you so much!! Have you tried out an air fryer yet? I bet these would do great in one! I homeschool as well and just love it. I don’t have an air fryer but I’ve seen them here and about. I do have a convection oven so I’m glad you made that comparison so I can kind of wrap my head around it! Thanks for being a real down to earth lady…. Oh absolutely! I used to make them with bread crumbs but switched to parm for low carb. They are WONDERFUL, same recipe, just use crumbs instead of the cheese. You don’t have to use any parmesan at all. I’m a big fan of not eating things you don’t like ;). Thank you for being here, Brenda!! I enjoy reading all of your recipes and comments. I use many of them, However I don’t use Facebook and never will so I miss many of your goodies. Would be helpful to find you on some other sight if you aren’t posting in your blog. I’m always posting here, this is kind of my hub. 🙂 You must be subscribed to my newsletter so that is the absolute best way to stay in touch – thank you!! Yum, those look really good, nice and crunchy. 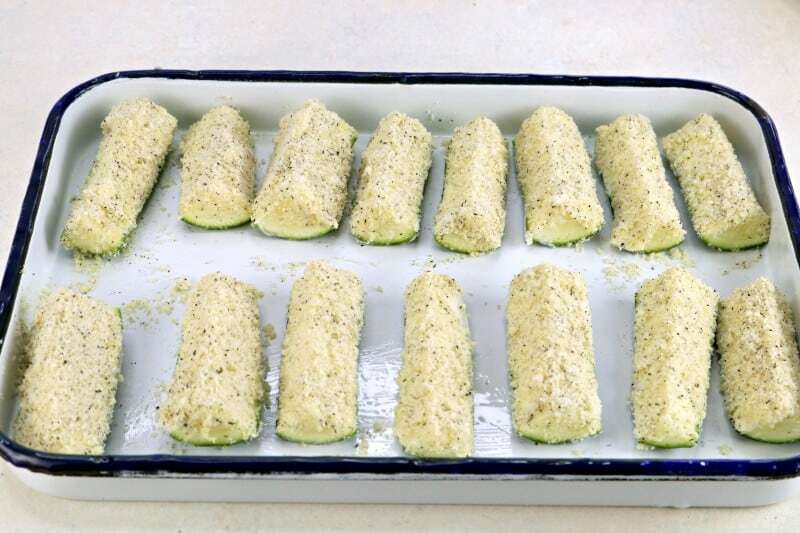 I love to stuff a scooped out zucchini with a little panko, olive oil, garlic powder, salt/pepper, and fresh chopped rosemary and then bake it. It is my favorite lunch, especially during the summer. I will have to try this version for a change, thank you. I have been wondering how your low-carb lifestyle has been going as I have not heard much about it as of late. I hope you are continuing to have success–I would love an update!!! I make a dish similar to this, but instead of the mayo, I use Italian dressing. It is soooo good! I would like to know what you like to dip yours in after they have baked? I will also be liking you Facebook page if I haven’t already. Thank you so much Carol! I don’t really are for sauces myself but my family enjoys ranch and come back sauce 🙂 I just eat them as is. Hi Christy… Shame on me. I thought I had liked your FB page, but lo and behold, I never did. That has now been rectified. 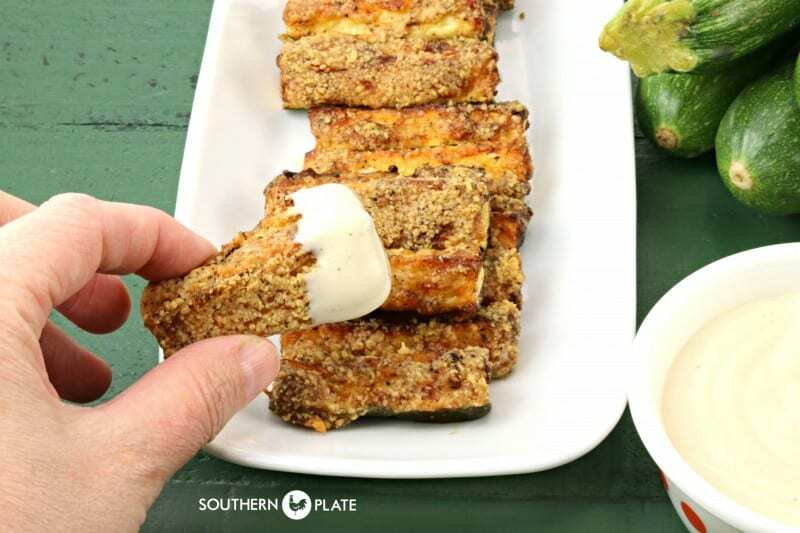 I am looking forward to making these Low Carb Zucchini Fries. Crunchy, is one of my favorite textures in food. I am the one who wants the little bits of French Fries that end up in the bottom of the basket and could care less about the other pieces. And don’t even try to beat me to them. Not a pretty site. Shall we talk about Brownie Corners? I am known to hide them when I have baked a batch of those beauties…Four crunchy, crusty corners are my idea of nirvana. Oh my goodness, I love crunchy too!! I hope you have a blessed day!! I put on a pair of jeans today and decided today was the day to get back on low carb and STAY ON. So glad you are also thinking about it. I have so enjoyed your other low carb recipes ( I like your others too, but low carb helps me feel good. fries is the number…as in how many carbs? Christy I absolutely adore fried zucchini but this sounds even better and I am trying this tomorrow . Thanks so much! I hope you enjoy them as much as we do!! Can’t wait to hear what you think! These look very good and crispy! Another good way to use zucchini and no fuss. Thanks for another great recipe Christy! Thank you Jayson, I hope you get the chance to try them soon!! I made this receipe tonight and I loved it. It was so good and so easy. I will share this receipe and continue to make it in the future. I am so glad to hear you liked it Ann!! Christy I love your blog! I am wondering if you have had the opportunity to try an air fryer yet…..they have me so curious and sound wonderful, but I wonder if they actually work. I know all the celebrity chefs like Curtis Stone, Paula Deen and Todd English and even Emeril seem to have one. I am so glad you liked them Christine!!!! These sound really good. I am not looking for low carb as much as low sodium. Do you have a suggestion for replacing the added salt with another seasoning? Hi Christy. I am allergic to mayo, but would like to try this recipe. Is there something else I can use instead? I guess I’m a little late with my comment but these look fantastic! I can’t wait to try them. Sorry, but I choose not to be on FB, but I follow your blog with zeal! Have a blessed day and be watching the weather, chance of severe storms this morning!! I hope you get the chance to try them soon Marilyn!!! Well, this recipe is so good that I shared it on Facebook and pinned it…twice!!! 🙂 That made my day!! I am so glad you liked them. Christy, I just made a small amount of the zucchini fries and they are delicious. Another easy favorite way to fix squash. Thank you for posting this recipe. By the way, your Apple Dapple Cake is wonderful. Think it’s time to make one. I like a lot of your recipes. Thank you so much Virginia!!! I am so glad you are enjoying the recipes and when you make the Apple Dapple Cake, have a bite for me!! Blessings and Hugs! you stated ” I don’t actually like mayonnaise. I know, I know, between that and the fact that I have zero interest in football it is a wonder the South lets me stay.” Right there with you! I do eat coleslaw if it’s not too mayonnaise-e and don’t do football at all except fuss when it messes up my tv programs. I’m going to try these as I do like fried onions, zuccchini and yellow squash. I have an ally!!!! 🙂 🙂 🙂 Sounds like we’d get along from start to finish! A really good dipping sauce is mixing mayo with Sriracha. I usually do 1-2 tablespoons of mayo, and then stir in Sriracha to taste. Great sauce for fries, chicken tenders, using it on a burger, etc. Absolutely loved these! Followed your recipe all the way and these turned out amazing! I ate way too many but since these are so low carb, I don’t feel guilty at all. I have a garden overflowing with zucchini and have been looking for as many recipes as possible to keep from wasting. Thank you for this super easy and delicious recipe. On my way back to the kitchen to make some for my husband and daughter. I am so glad to hear you liked them Rebekah!! I hope your husband and daughter do as well!! This recipe is the only reason I buy the powdered parm. So yummy. Your recipe makes good baked onion rings and oven fried dill pickle wedges too. I’ve had something very similar to this at a local chain restaurant and always wondered how they are made. Just as another suggestion, they serve them with a garlic aioli dipping sauce that is so good. We call them “crack fries” because they are definitely addictive! Eliminate the salt. Parmesan cheese is loaded with salt and most of us (unless we are 20) have high blood pressure these days. I am so glad you like them Liza! 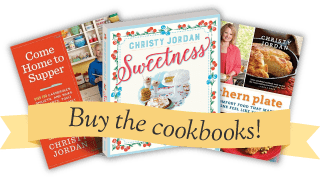 I hope you find some other recipes you enjoy on Southern Plate!! These are s-o-o good! I have made them several times already… thanks so much for sharing this easy, delicious recipe. Hmm, I think I’ll make some tonight. I am so glad you like them Jacki, we love them too! !